or Erin is Celtic; from Eri or Iar (western). Wormius derives the word from the Runic Yr, a bow. Called by the natives Erin, i.e. Eri-innis, or Iar-innis (west island). By the Welsh Yver-den (west valley). By Apuleius, Hibernia, which is Iernia, a corruption of Iar-inni-a. By Juvenal (ii. 260) Juverna or Juberna, the same as Ierna or Iernia. By Claudian Ouernia, the same. By moderns Ireland, which is Iaren-land (land of the west). Among all the early literatures of Europe, there are two which, at exactly opposite corners of the continent, display most strikingly similar characteristics. These are the Greek and the Irish, and the legend of the Irish champion Cuchulain, which well illustrates the similarity of the literatures, bears so close a resemblance to the story of Achilles as to win for this hero the title of the Irish Achilles. Certainly in reckless courage, power of inspiring dread, sense of personal merit, and frankness of speech the Irish hero is fully equal to the mighty Greek. Set aside some time for yourself and venture on a journey through a landscape of vibrant stories cultivated by an ancient people! Experience a vital and illustrious existence, spanning nine thousand years, and within its pathways uncover the threads of relevance to intertwine within your own life. An immersive library of resources exploring the cultural and historical legacies of the people of Ireland. Within Ireland resides a wealth of cultural treasures. For over a thousand years artists and scholars have transmitted this grand legacy of literature and lore unto future generations. Persevering through long centuries of hardship, and great opposition, Irish culture and the lamp of Celtic Spirit burn vibrantly at the dawn of a new Millennium. Through this digital information age many contemporary scribes are working to interpret these works anew, preserving Irish culture for the centuries ahead. Earthlore has supported this important work for over five years by developing educational resources within contemporary media. Our primary objective is to provide a broad public with accessibility to the vitality of traditional culture. It is our belief that a developed appreciation of the past teaches us a great deal about who we are today, and who we may yet become in centuries in front of us. In elder Ireland, individuals who held these two positions were awarded a great respect. Rarely were written texts set down. The history and so the very power of the clan was entrusted to those skilled in the arts of memory, lore keeping and story telling. Despite its modest size and isolation as an island country, the influences of Ireland upon Western civilization have been profound. 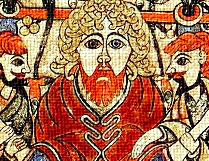 During the 'Dark Ages' of European history, Ireland lived through a period of expansive learning and artistic development. The creative and intellectual expressions of the Irish people from this era served to nourish cultural and religious centers across the continent over time. The technology of print publishing reach Ireland early and established an immediate foothold. In 1551 the Book of Common Prayer was published in Dublin by Humphrey Powell. Twenty years later the first publication entirely in Irish charaters was printed; Aibidil Gaoidheilge, agus Caiticiosma (ABC and Catechism) by John Kearney. Thomas MacDonagh is speaking here of the poetry that is being written to-day, of the poetry that comes out of a community that is still mainly agricultural, that is still close to the soil, that has but few possessions. And yet, with this naiveté there must go a great deal of subtility. Like the Japanese, says Kuno Meyer, the Celts were always quick to take an artistic hint; they avoid the obvious and the commonplace; the half-said thing to them is dearest. 6 This is said of the poetry written in Ireland many centuries ago, but the subtility that the critic credits the Celts with is still a racial heritage. Irish poetry begins with a dedicationa dedication of the race to the land. The myth of the invasion tells that the first act of the invaders was the invoking of the land of Irelandits hills, its rivers, its forests, its cataracts. Amergin, the first poet, pronounced the invocation from one of their ships, thereby dedicating the Milesian race to the mysterious land. That dedication is in many poems made since Amergins timethe dedication of the poet to the land, of the race to the land. (5) Literature in Ireland. (6) Ancient Irish Poetry. Together, Northern Ireland and the Republic are comprised of four provinces, which consist of thirty two counties. Today the spiritual and artistic wells of Ireland still soothe the soul-thirst of the faithful from many traditions. Throughout the world, the hearth fires of our ancestors are drawing us together once again. There is much we can learn, within our modern age, from the histories and cultural accomplishments of those who passed before us. It is an honor to our predecessors, when we turn from the transient news of the day, and pause to listen to the words of an old folktale. It is also a gift to ourselves, for we may often find a familiar passage or story worth holding on to and making our own. Within Earthlore will always be found paths of learning and exploration through cultural subjects such as the great cathedral era of medieval Europe or the innovations in religion and philosophy of ancient Egypt. You will also find journeys into larger questions; Who are we, reflected through our cultural heritage?... What are the historical forces which led us to where we are today?... What, if any, is our destiny as globally connected, yet unique, cultures? Here, you may explore the great mysteries of history, and perhaps come to understand a little more about the mystery of your own self. The intent of Earthlore is to encourage and support individual quests and original thinking. These features were created as source for content rich interaction with subjects of cultural history. To this end, the content featured will center around the personal experiences and findings of those who have immersed themselves in these subjects. All subjects will be treated objectively and presented in a manner best suited for subjective utilization. Within this stance, we look forward to the sharing of your own views! At the center of this journey is the Content Directory of Ireland. 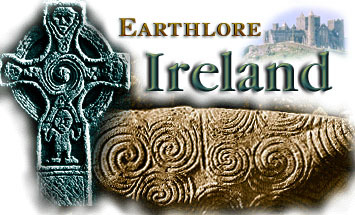 Here you will find a review and guide to all existing pages regarding or related to Ireland. Updates will be posted for features which are under production or near release. Content copyrights: ©1995-2018 - Exclusive rights reserved.